Chiesi is Top Employers again! 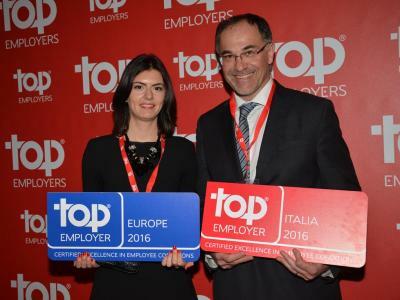 Chiesi receives today the Certificate Top Employers Europe for the fourth year in a row. The prize is assigned only to those organisations that create optimal employee conditions, upon evaluation of the HR strategies and policies. The CRF Institute uses a proprietary method based on the HR Best Practices Survey that checks different areas: salary, working conditions and benefits, trainings, development and company culture. Chiesi receives the certification thanks to the excellent corporate environment created for its people. The Optimal social and cultural context, as an integrated approach, ensures that people develop themselves personally and professionally. The Top Employer Europe certification is granted to organisations that are top employer in at least five countries; Chiesi is certified in the following: France, Germany, Italy, Spain, United Kingdom, Poland and for the very first time also Chiesi USA has been recognized a Top Employer. Each country division has to participate in the HR Best Practices Survey and follow the entire process to become certified, that is why the European recognitions is a so honourable.